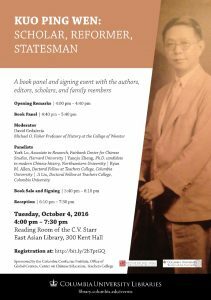 Our library, in partnership with Teachers College, the Columbia Confucius Institute, the Weatherhead East Asian Institute, and the Office of Global Centers, will host a book panel and author signing event for Kuo Ping Wen: Scholar, Reformer, Statesman (Long River Press, 2015). This event will take place on October 4, 2016 in our main reading room (300 Kent Hall) between 4:00-7:30 PM. Registration is required for participation in this event. This entry was posted in East Asian Events on September 30, 2016 by Ria Koopmans-Debruijn. No advance sign-up necessary. 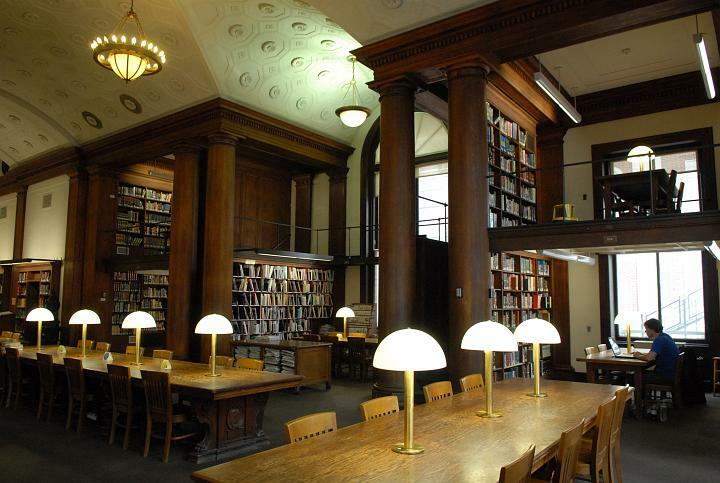 All sessions will be approximately 90 minutes, and take place in our Kress Seminar Room (access via stack level 200). This entry was posted in East Asian Events on September 26, 2016 by Ria Koopmans-Debruijn. The C.V. Starr East Asian Library, Columbia University, in partnership with the Department of East Asian Languages and Cultures, and the Weatherhead East Asian Institute will host “Cultural Revolution: Propaganda Art and Historical Memories” exhibition from September to November, 2016. The exhibition will be inaugurated with a film screening, a lecture and a reception on Thursday, September 22, 2016, 4:00-8:00 PM. Please use the Registration form to register for the film screening, lecture and reception. 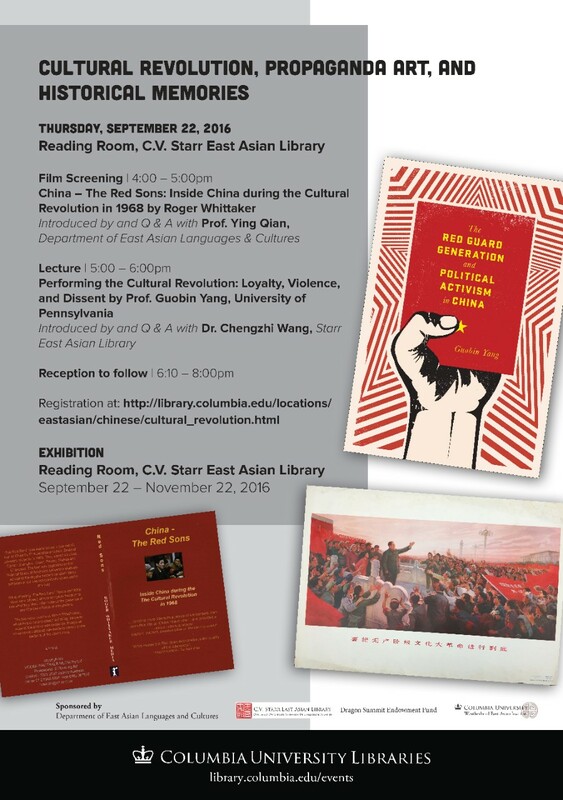 The two-month exhibition will showcase the Cultural Revolution collections of the C.V. Starr East Asian Library, particularly posters, pamphlets, booklets, documents, and Mao badges and busts. The film screening will present “China – The Red Sons: Inside China during the Cultural Revolution in 1968”, a rare documentary film on Chinese people taking part in Cultural Revolution shot by Australian filmmaker Roger Whittaker during a trip to China in 1968 organized by the Australian Union of University Students. The lecture will be delivered by Prof. Guobin Yang, University of Pennsylvania. This entry was posted in East Asian Events on September 21, 2016 by Ria Koopmans-Debruijn.